The theme here is MOUNTAIN HIGH, VALLEY LOW (70a. 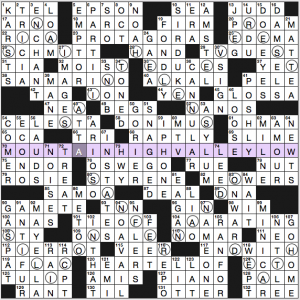 [Classic song with the repeated line “If you need me, I will be nearby” … shown symbolically in this puzzle]), and the circled squares have mountain names that go up to a peak and down again, and valley names that dip down and back up. We have Mount SINAI, Mount SAINT HELENS (erupting a bit now! ), and Mount EVEREST, and then three California locales, SILICON Valley, SAN FERNANDO Valley, and DEATH Valley. Now, the concept is cute, but I have a problem with Silicon Valley being the name for a region that includes the Santa Clara Valley rather than an actual geographic valley itself. You see how much of the grid is affected by the inclusion of those zig-zag diagonals of circled letters? When you’ve got this many squares that have to work in three directions (Across, Down, diagonal), you tend to get mighty constrained fill. For example, the opening corner gives you K-TEL, ARNO, SCHMITT, and two Spanish words crossing KARSTS, TRICIA, and LOAM. I imagine a lot of solvers hit the skids right there and moved to another section … where PROTAGORAS (23a. [Greek philosopher who wrote “Man is the measure of all things”]? I didn’t know him) and EDUCES hit … and then the right corner has MATTEA crossing Latin GLOSSA. Drop down a ways, and you discover a difficult clue for DEAL, 87a. [It’s least palatable when raw], making it markedly harder to piece together Minneapolis suburb EAGAN and Chinese dynasty LIAO … both of which also cross uncommon-in-the-U.S. name NOMAR. I did like DOE EYES, Stevie Wonder’s “SIR DUKE,” ENCHANT, and TIE OFF (why? not sure), but there wasn’t a lot of other charm in the grid. It’s rough to plod through a 21×21 grid when the fill isn’t pleasing you. 32a. [Like some brownies and towelettes], MOIST. My brother-in-law recently posted an NYT link about “word aversion” on Facebook and noted, “It is an adjective that should modify only two nouns: cake and towelettes.” Personally, I have no issues with the word moist. 58a. [Howard Stern rival], DON IMUS. In the grid, it looks like one word, presumably something akin to animus. 36d. [Shaped like a tube], CANNULAR. Well. I know the noun cannula well (when someone’s getting oxygen through a tube, that’s a nasal cannula), and the verb cannulate (to insert a cannula into the body), but I’m not sure I’ve ever seen this adjective despite those years of medical editing. Three stars from me. I mostly ignored the circled letters while filling the grid, and didn’t much enjoy the solve. 27a, STANDING EFFORT [Exertion while getting up?”]. Outstanding effort. 60a, ROUGH LINE [Pickup shtick that needs refinement?]. Rough outline. 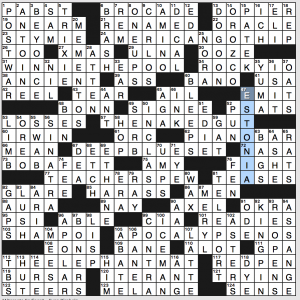 Bonus points for working the phrase “pickup shtick” into the clue. 70a, LYING AREA [Place for perjurers?]. Outlying area. 86a, BOUND FREIGHT [Ship’s secure containers?]. Outbound freight. 102a, AUSTRALIAN BACK [Wing for rugby’s Wallabies?]. Australian outback. I know basically nothing about rugby, so I’ll have to take Gail’s word for it that “wing” and “back” are synonymous in this context. Someone pipe up in the comments if you know more. 37d, SOCIAL CAST [Gregarious play group?]. Social outcast. 45d, BORDER POST [Blog entry about garden edging]. Border outpost. Some cool stuff hanging out in the surrounding fill: SEMI-ARID, NEAR BEER, MAIN DISH, JOB CORPS, ICE FOG, WANNABE, GO DUTCH, P AND G next to G SUIT. Normally I’d be all over E-NOTE, but frankly the clue [Cyberjotting] is so kooky that I feel like it’s acknowledging what a nonphrase that is. Best clue is probably [Collectors’ items?] for DEBTS, or maybe [Old will?] for SHALT. 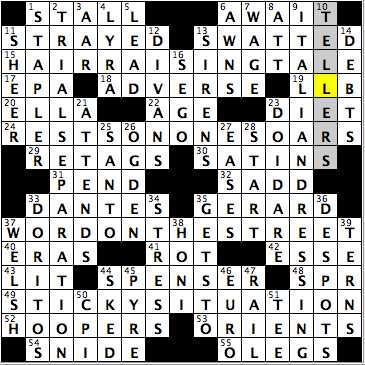 Exactly the kind of low-stress solve I’ve come to know and love from the LAT Sunday puzzle. Good stuff. Until next time! What a difference a letter makes. In today’s offering, Evan changes one letter at the end of a movie title. Mayhem and merriment ensue. Sort of. 57a [1988 cop spoof that, with an alternate ending, shows a bare belly] = NAKED GUT (Naked Gun.) Thanks, Evan. Now I’m thinking of Leslie Nielsen without any clothes on. 67a [1999 sci-fi thrilled that, with an alternate ending, shows an array of chess-playing computers] = DEEP BLUE SET (Deep Blue Sea.) Deep Blue is the IBM chess-champion CPU. 105a [1979 war epic that, with an alternate ending, shows how 666 and other figs. portend doom] = APOCALPYSE NOS (Apocalypse Now.) “Figs.” in the clue gives us the signal that there’s an abbreviation in the answer, so we get “nos” for numbers. Meh. “NOS” in medical coding means “not otherwise specified”, and I find that interpretation much more entertaining. 112a [1980 drama that, with an alternate ending, shows Dumbo’s wrestling pad] = THE ELEPHANT MAT (The Elephant Man.) “I…am…a…mat” does not have the same ring to it. So there you have it. There’s not much actual solving here – the clues pretty much tell you exactly what to do. I didn’t have a lot of fun filling in the grid, even though some of the answers were amusing. EDIT: BIG OOPS on my part. I should have known there was more to it than that. I didn’t read the notepad (because I never read the notepad) and I didn’t think hard enough about why there was not much to this puzzle. The alternate endings spell PLOT TWIST. The original endings spell CHINATOWN, which has a memorable PLOT TWIST. Mea culpa! That was a huge miss on my part and changes my assessment from “meh” to WHOA. Quite a feat of construction. Thanks to PJ Ward for pointing it out in comments and to Evan for alerting me via Email. Sorry again. If you’d asked me yesterday if I knew who made Colt 45 malt liquor, I would have said “no,” but when I saw 1a I wrote PABST without any hesitation. Sometimes it’s a little scary to discover what’s lurking in my hippocampus. There’s an urban German double-header with ICH (bin ein Berliner) at 16d and BONN at 48a. I saw 67d [Raiders’ org.] and confidently filled in the center F, figuring it was either NFL or AFC. Wrong. We’re looking for raiders of drug dens, and the answer is DEA. That confused me for a while. KINGPIN shows up as an answer at 92d after serving as a clue in yesterday’s Stumper. I did the two puzzles in sequence and for a minute I thought there was a dupe. Nope. What I didn’t know before I did this puzzle: that ESTONIA borders the Gulf of Finland. First of all, a confession. 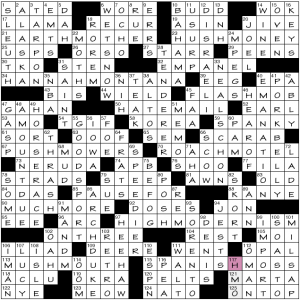 This puzzle suffers unfairly for a subjective reason—its theme is so similar to the WSJ crossword I wrote about yesterday: a central trigram. In the Journal it was GPA and here it’s HMO (as revealed by 117d [Med. plan that sits in the middle of this puzzle’s 10 theme answers], not to be confused with 36d [Biomed. org.] NIH). 21a. [Nursing figure] EARTH MOTHER. Hum. Wouldn’t ‘nurturing’ be better? 23a. [Bribes] HUSH MONEY. More editorializing: clue would be better with a ‘perhaps’. Don’t know the percentage breakdown, but I’d posit that the majority of bribes are used for influencing decisions and the like, Hush money is what one gives to an extortionist or blackmailer. 34a. [Miley Stewart’s rock-star alias] HANNAH MONTANA. 45a. [Organized publicity stunt, say] FLASH MOB. 67a. [Landscaper’s tools] PUSH MOWERS. 70a. [Bug catcher] ROACH MOTEL. 90a. [“The Fantasticks” song] MUCH MORE. 97a. [Belief that technology will reorder the social world] HIGH MODERNISM. New to me. 115a. [Growth on Southern trees] SPANISH MOSS. 40d [Bad odors] EMANATION. Again with the pejorative assumption for an essentially neutral term. Usually I’m opining about ODOR being clued disparagingly. Guess it’s worth noting that the clue here provides a modifier for odor, even though it’s entirely gratuitous. 45d [Spirit regulators (abbr.)] FAA. Cloaked capital for Spirit (the airline); a solver is tempted to fill in ATF. 82d [Hybrid golfer’s garment] SKORT. What’s a hybrid golfer? 58a [The Hermit Kingdom] KOREA (not DPRK or N(orth) KOREA, hmm). 63a [“Ugggh”] OOOF. Pretty sure this is intended to be meta, especially with the three Gs. Maybe it was the priming of 105a [Lille old me?] MOI, but I’ve belatedly realized the pun in 106a [Troy story] ILIAD, a clue formulation I’ve seen before. Oh, dupe with 83a [Past its prime] OLD. Sheesh, all my bullet points are turning out negative. Let’s see … the long downs were nifty. Stacked EMANATION and PORK BELLY, stacked AMOUNT DUE and HORSE RACE. GOOD SPORT, full name of Journey guitarist NEAL SCHON (maybe a tad obscure? More or less so than Depeche Mode singer David GAHAN? ), ARCHDUKE (crossing ARC, not to mention 60d [HR director on “Archer”] PAM … oh, dammit, stay positive! ), and DISRAELI. You know what? I’m going to quit while I’m behind. It’s an okay crossword and I’m simply not giving it a fair enough shake. What’s for lunch? Good afternoon, everyone! Today’s Challenge was brought to us by Mr. Bruce Venzke, and it played a little on the easy side, at least after I finally got a foothold into the puzzle. 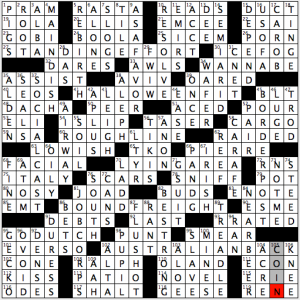 Again, there were many 15-letter entries – six to be exact – for me to sink myself into, and see how many of those I could figure out without needed too many crossings. Only from the beginning “R,” I got the “rest on one’s” part, but needed the crossings to complete it, REST ON ONE’S OARS, since I had not heard “oars” used before for that (24A: [Coasts]). Now thinking about it, and seeing many different rowing races and the the participants resting on their oars after the race is over, it makes total sense. To be honest, that happened with three of those long answers for me, as I had the “separation” part filled in for TRIAL SEPARATION (2D: [Experiment in living apart]) and the “dressing” part for ITALIAN DRESSING filled in before filling in the first words of those entries later on (9D: [Salad bar selection]). It had been a while since I had heard WELSH being referenced to an unpaid debt, as opposed to the demonym for people from Wales (37D: [Don’t pay a lost wager]). Only real mishap I had was putting in “futons” instead of DIVANS, especially since the last two letters of both words are the same (12D: [Furniture pieces]). Have a great rest of your Sunday, and thank you for reading and taking the time out! This entry was posted in Daily Puzzles and tagged Andy Kravis, Brendan Emmett Quigley, Bruce Venzke, Evan Birnholz, Gail Grabowski, Victor Barocas. Bookmark the permalink. Wait, don’t go yet! 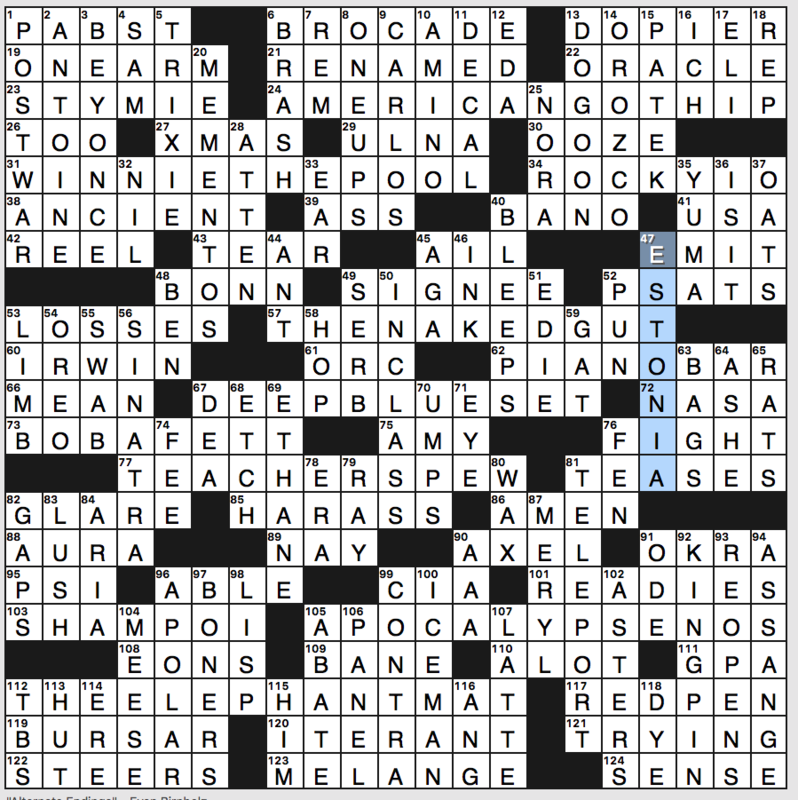 You may want to check out the Notepad — I hid an extra feature in this puzzle. Another random question: For the online crossword software(s) that awards a score point value (LAT, Evan’s grid, CrossSynergy, I’m sure others), is there a definitive guide out there on exactly how these points are awarded? There is no written guideline, that I’m aware of. The ratings are based largely on subjective assessments. No, Glenn is referring to the crossword interface software itself, not the ratings here. Presumably they’re based on speed and accuracy, but I don’t happen to know their definitive, quantitative criteria for awarding points. Yes, pannonica is right. I was referring to the online interfaces (even Across Lite) that have a scoreboard of some kind that involve a point value. Like I can do a LAT grid and when I get it done it’ll say I scored 1850 points (for instance). There doesn’t seem to be much rhyme or reason on the face of it why I might get one point value one time versus another value another time. Then those sites have leader boards, so it seems like a good question to know how such things are scored in order to improve in such a way. (the only real one I have found an answer to on this is the CrossSynergy grids, but you think on something that has “leaderboards” based on these point values, that “The Rules” would be clearly posted somewhere. 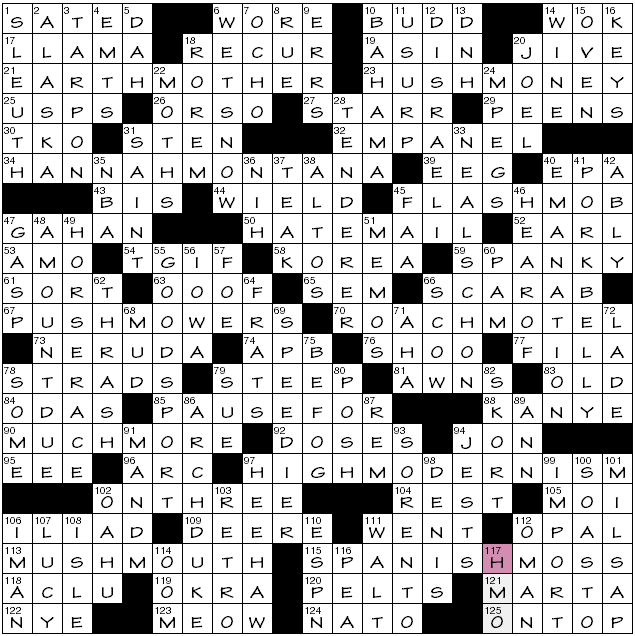 WaPo – After solving we’re left with two sets of nine letters – those that were removed from the original titles and those that were added. When taken in grid order, the letters that were added give us PLOT TWIST, which describes what’s going on in the clues and entries. The original letters, when taken in grid order, spell out CHINATOWN, which has one of the all time plot twists. Finding nine movie titles where the last letters can be replaced with P, L, etc. and still be viable (if somewhat zany) titles is nice. Having the letters removed, when taken in the same order, spell a movie with an all time plot twist is a whole nother level of clever. I hope Matt Gaffney takes note of this one…Puzzle of the Month for me! Me too – stunning construction feat! Yes. Excellent, and I’m so sorry I missed it! Post edited. I have to agree with Jenni’s original assessment: “I didn’t have a lot of fun filling in the grid…” The meta part of the puzzle does, indeed, exhibit a lot of construction bravado from Evan, but it added nothing to my solving experience. As is the case in most meta puzzles, I come here to find out what the meta solution is. The swap-a-letter theme entries were good but, again in agreement with Jenni, not much challenge to parse, even without the aid of the crossings. Sorry, Evan, this one just didn’t tickle my fancy. 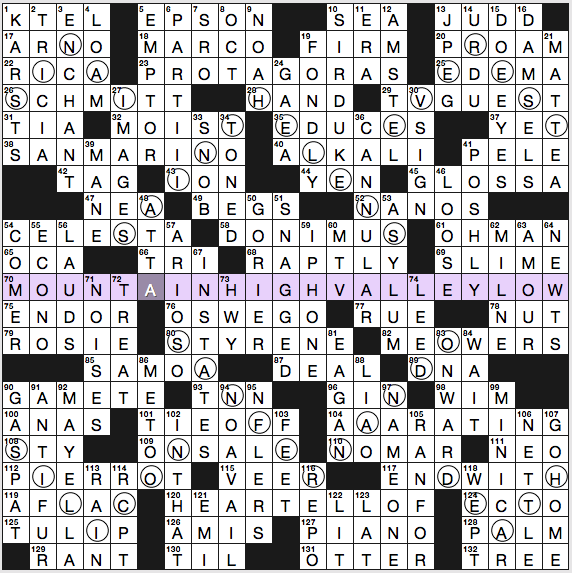 I got bored with the NYT and stopped solving just short of the revealer – might have liked it better if I had kept going and seen the valleys in the lower half of the puzzle. Had I finished, I don’t think I’d have had a problem with SILICON valley, even if it’s not the name of a geographic feature, but Amy’s comment raised a little different issue in my mind. While all of the valleys are commonly spoken of with the word “valley,” none of the mountains are spoken of with the word “mountain” – it’s always Mount Sinai or Mount St. Helens, etc. NYT: I agree that the theme density makes for some tough fill. That initial K in 1A could have gone to a C without a problem for me, since CA makes a hard sound and I did not know or couldn’t recall KTEL… It seems like Naticking people in 1A is not a great start. But I always give points for originality and taking some risk. And I also found that knowing the theme was helpful. Once I got a foothold in an area, I’d try to guess the mountain or valley and it gave me letters in entries that were not otherwise coming. Oh, and I liked SILICON Valley. I totally get where Amy is coming from, but somehow it was cute. San Fernando Valley is hardly idyllic… in spite of being in California, the 3 valleys were more eclectic than the mountains. >But I always give points for originality and taking some risk. @Jenni What I didn’t know before I did this puzzle: That there is a Gulf of Finland. So you’re at least one up on me. Funny how one person’s esoterica is another one’s gimme. Growing up, I could see the Gulf of Finland from our house (or, more accurately, our apartment window). Mixed feelings about today’s puzzle. It’s incredibly difficult to pull off what Victor and Andy did, but I also wanted to see more traditional theme answers going all the way across to fill this gnawing feeling like something’s missing. Can’t please everyone. And, frankly, shouldn’t. Good questions, Bruce and pannonica. Is the word order of the clue meant to mislead? Should it not, more correctly, be “Golfer’s hybrid garment”? pannonica: You wrote, “…oh, dammit, stay positive!” It’s not easy to do when the puzzle contains so many irksome aspects. I have to tell myself the same thing when I’m doing many of BEQ’s puzzles. NYT: A small quibble about Amy’s toss-off complaint about the ‘uncommon-in-the-US name NOMAR’: It may indeed be uncommon as a name but the answer to 110A (Six-time All-Star Garciaparra) is a gimme to sports/baseball fans. Nomar starred with the Red Sox and then spent a few injury-plagued years each with the Cubs, Dodgers & As. His middle name, Nomar, is the reverse spelling of his father’s first name, Roman. And he’s married to US soccer great Mia Hamm. Yup. That was indeed a gimme, and didn’t bother me at all – unlike PROTAGORAS and POSHLY and the others Amy mentioned. Thanks, Patrick. 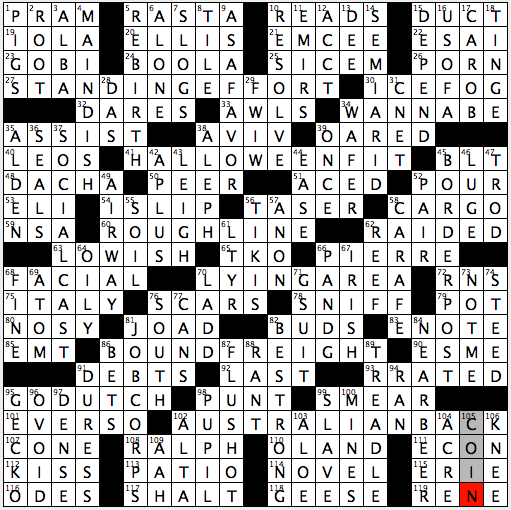 It’s sort of funny how it worked out; the crossword itself was about alternate endings, but the Post Hunt puzzle asked solvers to do the opposite and think of an alternate beginning for both FIGHT and FEN to get the relevant clue number. I can also report that a room full of Post Hunt solvers booed me when they announced how it worked. It was delicious, though I was kinda hoping for even more boos.